Boyer begins in the 1880s and follows the thirty-year reign of Porfirio Díaz and his embrace of foreign capital investment and scientific expertise, exercised by the regime’s cadre of científicos. The rapid acceleration of land titling (the so-called disentailment of communally owned property) and privatization of terrenos baldíos (unoccupied public land) and resources spurred the growth of commercial logging to meet the demands of the expanding newsprint industry and railroads. Observing the growing corporate commodification of timber resources, Boyer shows how members of the intellectual elite organized for conservation of the woodlands through a “regime of scientific management,” premised on similar initiatives in Europe and the United States (p. 30). Chief among these early conservationists was Miguel Ángel de Quevedo, whose long career in public policy withstood political transitions and revolution. Quevedo and the early forest service viewed conservation as a scientific and rational practice best orchestrated by urban Mexico City elites rather than the inhabitants of the woodlands themselves. What little consideration his urban foresters did give to rural peoples such as the Rarámuri of Chihuahua or the Purépecha of Michoacán, Boyer argues, was to criticize them as backwards, wasteful, and an impediment to rational management. 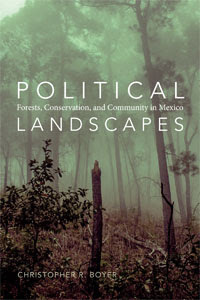 Chapters 2 and 3 chart the rise of “revolutionary forestry.” A rich historiography exists on the Mexican Revolution (1910-17) and on the subsequent agrarian reform which continued until 1992. Article 27 of the constitution of 1917 cleared a path for two legal channels for securing land rights: the restitution of communal land (restauración) or the granting of parcels (ejidos) of public land for usufruct use (dotación). And yet, Boyer points out, few scholars have noted Article 27’s significance in mandating the state’s right to manage natural resources on behalf of the nation. This charge led to the postrevolutionary state’s partnership with Miguel Ángel de Quevedo and his determined application of rational conservation in forestry. Yet Quevedo and other conservationists’ preferences for a state-regulated management bureaucracy complicated indigenous land rights supposedly protected under the postrevolutionary state’s social agenda. For example, the Forest Code of 1926 required ejido and native communities to form producers' cooperatives whose timber harvests were guided by scientific management plans approved by the new forest service. Other elements of the code, such as the ban on hatchets for felling, had the arguably unintentional effect of restricting native access to cutting timber in favor of commercial operations. As Boyer shows, the new bureaucratic hurdles presented challenges for ejidatarios and native villagers in Chihuahua and Michoacán, who struggled to assert their rights over unscrupulous outsiders and, when that failed, resorted to clandestine logging and the black market. When Lázaro Cárdenas assumed the presidency (1934-40) and raised the forest service to a cabinet ministry, he assigned Quevedo to oversee its operations and sort out its propensity for generating conflict. This era of “revolutionary forestry” increased the educational and technical assistance available to rural communities, intending to inculcate these populations in the state’s vision of scientific environmental management. Villagers who created formally recognized organizations enjoyed wide latitude in the harvesting of timber under the paternal eye of state foresters and regulators. As Boyer notes, “no one believed in the rule of experts more firmly than did Quevedo himself” (p. 103). Quevedo’s scientific authority clashed with the populist spirit of cardenismo. Yet the undoing of revolutionary forestry owed more to the heightened demand for natural resources during World War II and Manuel Ávila Camacho’s (1940-46) turn towards industrial growth. At the same time, an ascendant new generation of forestry experts began to shift “from cultural to sociological explanations for deforestation,” blaming poverty rather than rural people's essential backwardness for the forests' destruction (p. 133). As chapter 4 describes, forest management thus pivoted to a focus on wages through the growth of a modern, corporate timber industry. A new forestry code in 1949 cemented private industry’s enhanced access to woodlands through a system of timber concessions deemed to be in the public’s interest. Paradoxically, the political move away from community-led forestry actually presented some opportunities for rural and indigenous people to negotiate with logging companies and regional government agencies to secure access to the employment and income generated from forestry. On the other hand, an increase in temporary logging bans could provoke villager tactics such as girdling trees, setting fires, or cutting trees ostensibly for legal domestic use and then selling the timber illegally to sawmill owners--weapons of the weak in the politicized sierras of Michoacán and Chihuahua.